A more beginner oriented post this one. Possibly a 3 parter. Raspberry Pis are useful little computers. I own several, since I work with them in my day job, and I thought it was about time I put one to use. Male elephant beetle. 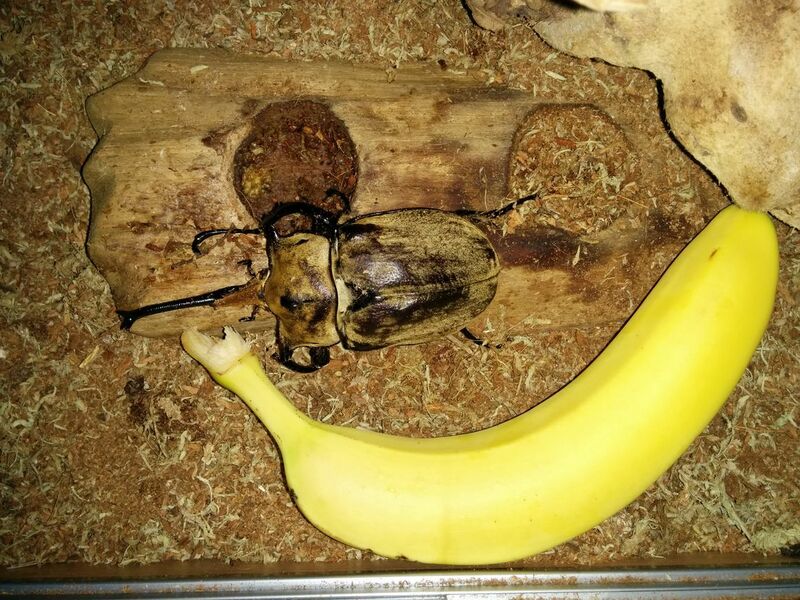 Banana for scale. These insects are mostly nocturnal. During the day they tend to burrow under their bedding material (moss), or hang out on a branch. But during the night, they can be quite active. I know this because in the morning they have re-arranged the branches in their tank. 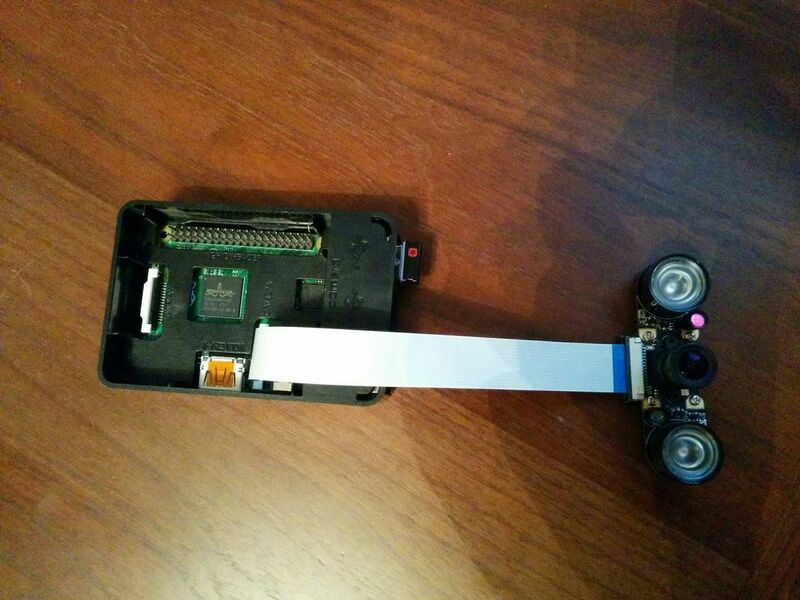 In this post I'll describe how you can install and run a Beetlecam on your own Raspberry Pi. If you don't happen to have the last one, don't worry, it will work with just about anything you would like to make a timelapse of. There are two parts to Beetlecam; there is a web application which shows the latest frame, and a script which periodically takes a photo and uploads it. Both are in the Beetlecam repository. This may take a while. Plenty of time for you to grab coffee. Once that has finished, you should be able to run the command moya -v.
This should create a folder, beetlecam in your current directory. Change to that directory, with cd beetlecam. In that directory, you should find a Python file called beetlecam.py. This is the script which periodically takes photos and uploads them. All the Python code does is take a picture then make a POST request to the web application. A POST request is what your browser does when you fill in a form on the web. In the case of Beetlecam, it is posting to this form in the same way a browser would. You will see some errors in the console, because we are not yet running the web application part of Beetlecam. You should now be able to point your browser at http://127.0.0.1:8000 and see the photos that beetlecam.py is taking. Or if you are using another machine on your network, you can use the hostname of your Raspberry Pi in the URL, by default that would be http://raspberrypi:8000. If there is enough interest, I'll post about how to create the timelapse videos . I'll also explain what beetlecam.py does in more detail, and go over the web application. Where did you get the light sources for the camera? It came with the camera. I got it from Amazon. I think it may have been this one. Hi Will, Thanks for all your hard work :-) I've just today, tried installing this on a fresh 'lite' raspbian Jessie install. All working well thanks, the only problem I had was with the line:- 'pip install moya picamera' which I had to do as super user ie. sudo pip install moya picamera I also seem to be experiencing a memory leak of about 28MB every 5 minutes, do you have any ideas about that as my Pi will run out of memory fairly quickly. Regards, Kevin. Hi Kevin. Good spot about needing sudo there. I didn't notice any memory leak on my Rpi. It was fine after running for few weeks. You might find memory usage stabilizes after a while. Not sure how much you know about linux memory usage, but there is a lot of caching done by the OS that might appear to be a memory leak. If it is a legitimate memory leak then you are right, it will fall over after a while. let me know if it is still running after 24 hours! Hi Will, Thanks for your reply, It's been running over night, it started to use the swap, got to about 12MB of swap used and now seems to have stabilised, interesting, I'll leave it longer. I've modified your scripts a bit to reduce the picture size and quality, (45kB per pic) and up'ed the refresh rate to about every 3 seconds, get the occasional miss, but seem to be happy. I'm assuming that the sql database is filling up, even though I'm going in occasionally and deleting older pictures, is there a way of tidying the database? just stop and re-start? Thanks for your help. Kevin. There could be a memory/object leak somewhere. I'll see if I can reproduce that here. 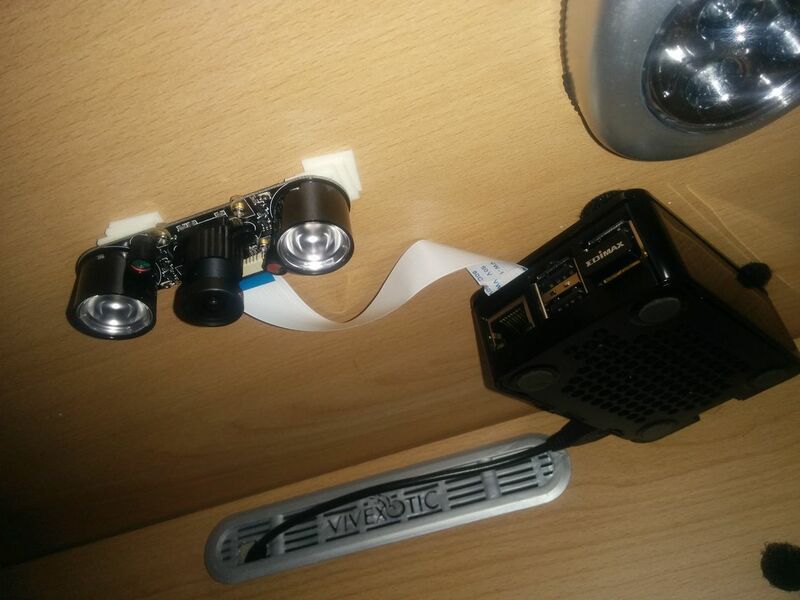 Are you running both beetlecam and the server on you Pi? There isn't a way of clearing out deleted items from there database at the moment. You could try adding that to the Moya app if you need it. It will only store a few bytes per frame, so it will be a long time before it gets too big. Sorry to be a nuisance :-( Kevin. Hi Kevin. That's an odd one. I can't reproduce it, but I did some googling, and it looks like sys.stdin.encoding can return None, which seems to be the root of the problem. I'm guessing it is something to do with how you run db sync, and runserver in a subshell. If that works, I'll add a the fix to Moya. Will, you're a genius :-) That has got it working perfectly. Many thanks. If you'd like me to test any fixes you put in Moya let me know. Regards, Kevin. Good to know, thanks. :-) I'll add that fix to the next release.